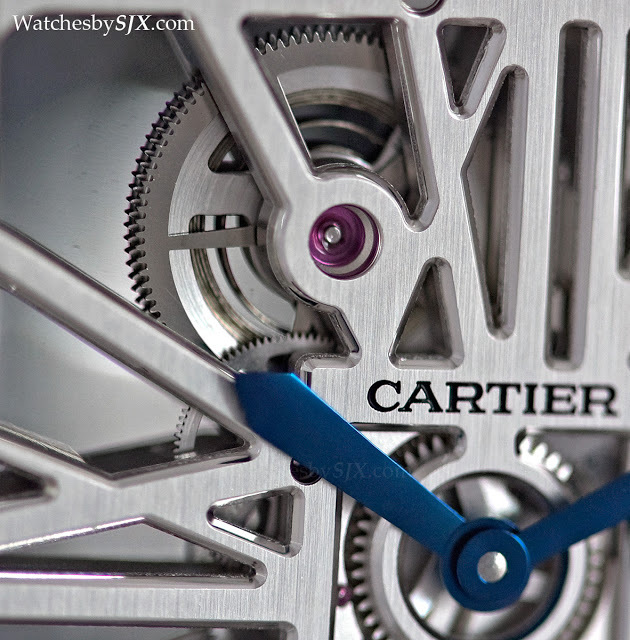 Earlier this year Cartier unveiled the Tank MC, the newest addition to the century-old Tank family. 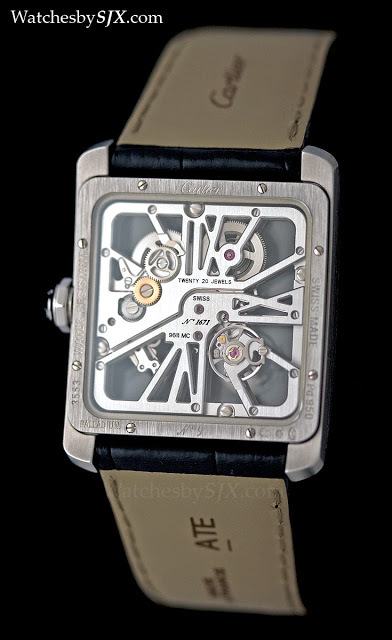 Equipped with an in-house skeleton movement inside a palladium case, the Tank MC is Larger and wider than other Tank models. 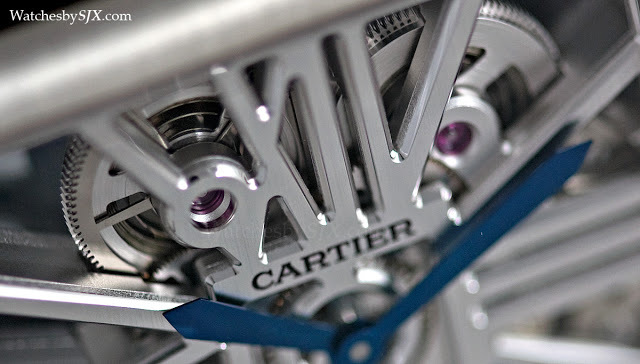 Undoubtedly one of the definitive form watches, the Cartier has been going strong, in its myriad shapes and sizes, for nearly 100 years. 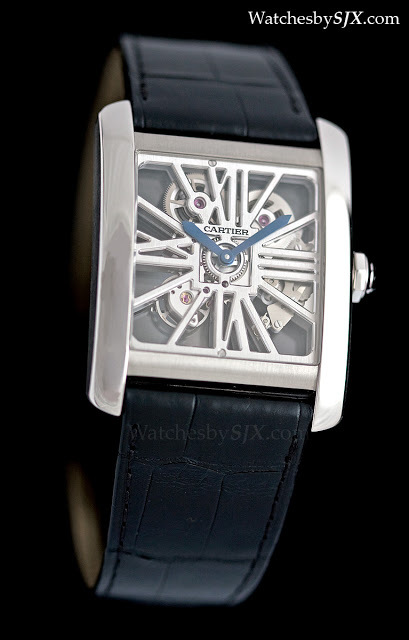 Cartier made a major new addition to the Tank family in 2013 with the launch of the Tank MC (MC is short for Manufacture Cartier), a large, rectangular wristwatch designed for the male watch buyer. 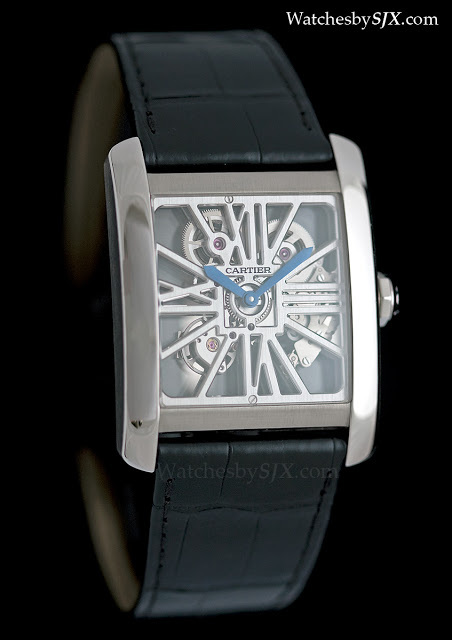 The Tank MC is available as an entry-level model with the in-house 1904 MC movement, and also as part of the high-end Fine Watchmaking line in the form of the Tank MC Skeleton. The only Tank watch with a skeleton movement currently in the collection, the Tank MC has a palladium case and the 9611 MC skeleton movement. 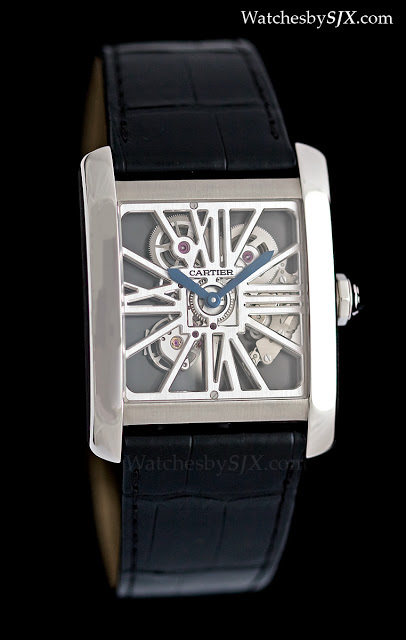 This is the same calibre found inside the Santos 100 Skeleton, likely the best selling Fine Watchmaking model. 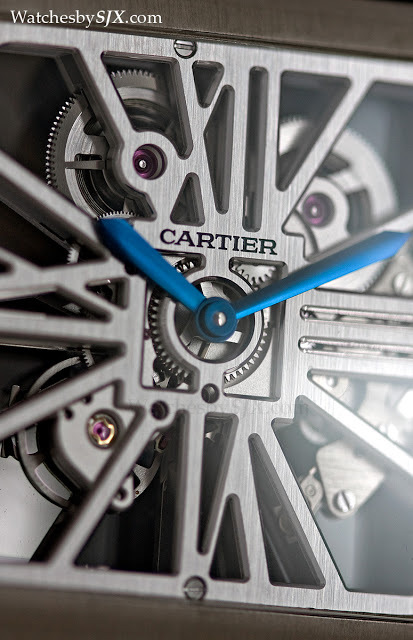 Developed by Cartier’s talented technical head Carole Forestier, the 9611 MC is a simple, manual-wind movement with double barrels and a practical 72 hour power reserve. 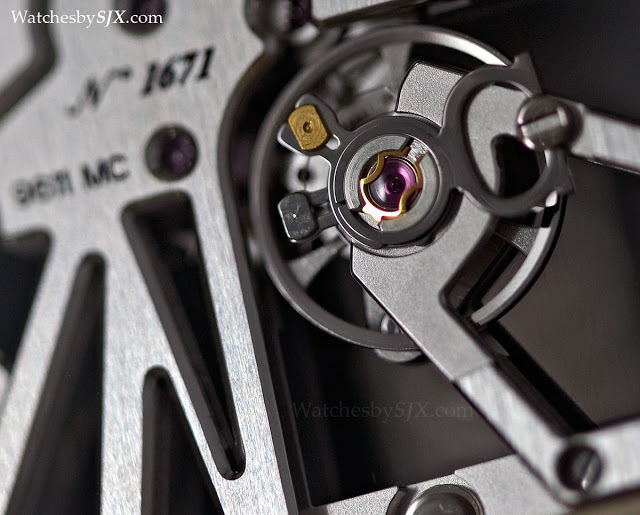 Though mechanically uncomplicated, the beauty of the 9611 MC movement lies in the shape and finish of its bridges and base plate, which form oversized Roman numerals. 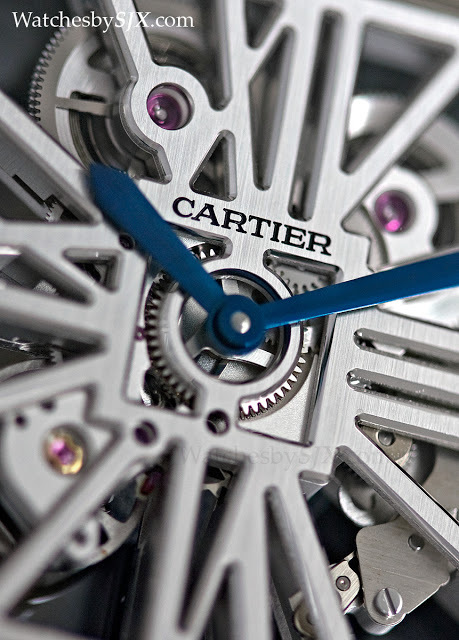 These open-worked numerals have become the signature of Cartier skeleton watches. Both the bridges and base plate share the same finishing, straight grained on top with highly polished bevels. The polished bevels, also known as anglage, is artfully executed and impeccable up close, though it has to be said the corners of the bevels are rounded, rather than sharp (Philippe Dufour’s Simplicity is an example of world-beating anglage). The latter is a far more complex and costly form of finishing. The Tank MC measures 43.9 mm long by 39.1 mm wide, making it more squarish than the typical Tank wristwatch, which tends to be oblong. Though the case is not especially large or thick, it has a reassuring weight due to the density of palladium. 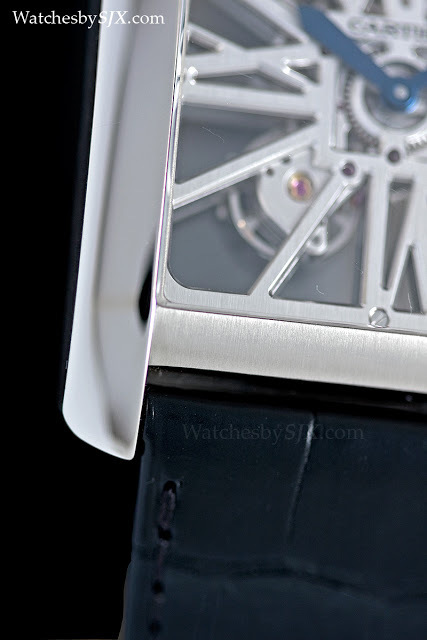 Being part of the platinum family of metals, the palladium case also has the white sheen associated with these alloys. 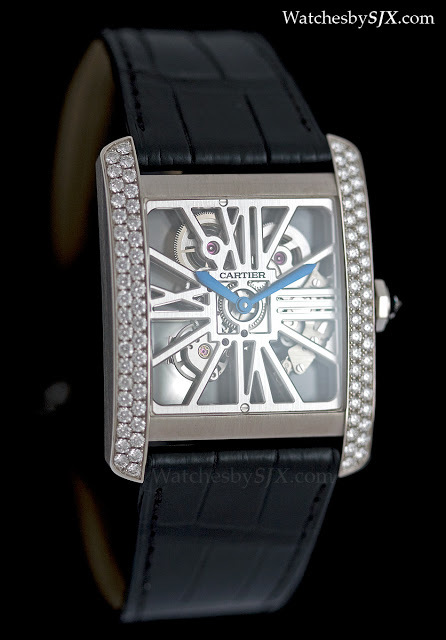 And for the ladies, the Tank MC is also available with diamonds set on both brancards of the case.